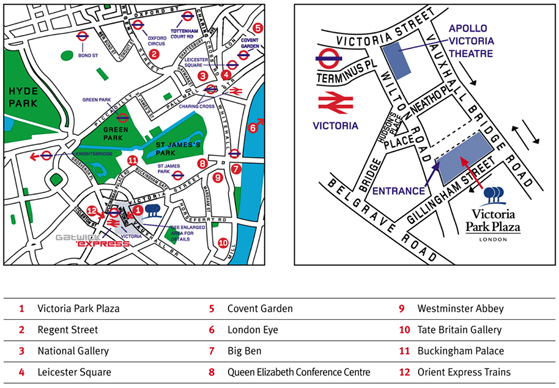 The 2014 UKNSCC will be held at the Victoria Park Plaza Hotel in central London - a compact, purpose built conference venue, the Victoria Park Plaza is an excellent facility, and was the venue for the 1st UKNSCC. The hotel's central location means it's easy to get to, and there's a range of hotels within walking distance. If you'd like a floor plan, please send an email to updates@uknscc.org and we'll email over a pdf of the conference programme which has a floor plan at the back. All delegates will get a copy of the printed programme and floor plan when they register for the event. 2 minutes walking distance from Victoria Underground & London Victoria British Rail Station (Gatwick Express, Connex South Central & Southwest Trains). Easily accessible with a direct train service from Gatwick airport to London Victoria rail station called the Gatwick Express. The Gatwick Express runs every 15 minutes and journey time is 30 minutes. Heathrow Express to Paddington station runs every 15 minutes. Journey time is 15 minutes. From Paddington station take London Underground District or Circle Line to Victoria Underground station. Accessible via London Underground served by Piccadilly Line. Transfer at Green Park Underground & go one stop southbound on the Victoria Line to Victoria station.